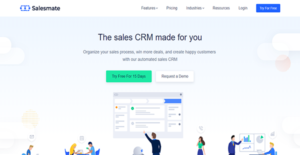 Salesmate CRM is a solution built for small and medium businesses to streamline the sales workflow and help win new customers. It has a host of robust and powerful tools that reduce your sales team’s manual workload so they can focus more on engaging and converting leads and clients. One of these is its visual sales pipeline that provides you with insights while being visually engaging. Salesmate CRM also offers smart emails which you can track. You are informed when your recipients interact with your email. What’s more, you can transform your best-performing business email into a template so you can leverage it in the future. Salesmate has built-in calling and texting tools as well. These allow you to get in touch with leads, prospects, and existing customers in a more personalized manner instantly. These also eliminate the need for additional tools and software for you to save your financial and computing resources. With Salesmate, it only takes a single click to connect with a lead or customer via phone. The software has a built-in phone that abstracts the need to juggle a CRM and a phone system. The software also supports the recording of calls and the taking of notes to ensure smoother future communications with customers. These are also beneficial for training and for the sales representative’s evaluation. Aside from the calling tool, Salesmate has a built-in text sender. This makes it easier for your sales team to update customers with promotional messages and important announcements. They can send these in bulk, too. This way, you can save time and ensure that everyone on the list receives the text. Working smartly helps you achieve more. Salesmate automates redundant tasks. This allows your sales representatives to devote more of their time in winning over and keeping your customers. You can begin leveraging this feature by building a standard workflow with action triggers. Know everything that goes on in your sales funnel with Salesmate’s reports and analytics. These give your sales managers the insights they need regarding their teams’ activities and performance. With these numbers, they can find ways to enhance their processes. More importantly, these help keep every stakeholder in the know. With Salesmate, you get shared inboxes. These ensure that collaborations run smoothly within your team. These also ensure that customers receive prompt replies from your company, especially when they are ready to convert or to make additional purchases. However, you can also assign emails to particular salespersons if the need arises. Apart from serving your sales communication needs, Salesmate can house your product catalog. This is beneficial when your sales representatives need to inform leads or customers regarding the prices and availabilities of your items. Additionally, you can utilize the catalog in creating deals and linking them to promotions so you can sell globally with ease. What Problems Will Salesmate Solve? It is easy to miss sales opportunities brought by recurring business due to delayed replies to emails. Salesmate’s shared inbox resolves this, as everyone on the team has access to the latest emails. As such, anyone can answer customers’ queries and close deals faster. Moreover, this helps in fostering long-lasting customer relationships. Calls usually happen with physical phones or with integrated calling software. Salesmate changes that by providing a built-in phone system. This enables sales representatives to get in touch with leads and customers quickly without wasting time juggling a PBX and a separate CRM. Additionally, the solution has texting, bulk SMS, call recording, voice mailing, and similar features. Field sales is challenging because of the recording processes. Salesmate eases such with its geolocation tracking feature. This gives field representatives a better experience, as each information they add to the system is automatically tagged with the location. Furthermore, this tool enables sales representatives to find new opportunities when meetings are missed or canceled. As such, they can motivate themselves and not feel that their efforts to travel have been wasted. Since each organization has particular business wants, it is prudent for them to abstain from seeking a one-size-fits-all faultless software application. Needless to say, it would be futile to try to find such a platform even among widely used software solutions. The clever thing to do would be to list the various essential elements that require consideration such as key features, budget, skill levels of employees, company size etc. Then, you should do your homework thoroughly. Read some Salesmate reviews and check out each of the other apps in your shortlist in detail. Such in-depth research can ensure you discard ill-fitting systems and select the solution that provides all the aspects you require for business success. How Much Does Salesmate Cost? Salesmate has two affordable options for enterprise pricing that you can pay for month-to-month or once a year. The details for these plans are as follows. We realize that when you make a decision to buy CRM Software it’s important not only to see how experts evaluate it in their reviews, but also to find out if the real people and companies that buy it are actually satisfied with the product. That’s why we’ve created our behavior-based Customer Satisfaction Algorithm™ that gathers customer reviews, comments and Salesmate reviews across a wide range of social media sites. The data is then presented in an easy to digest form showing how many people had positive and negative experience with Salesmate. With that information at hand you should be equipped to make an informed buying decision that you won’t regret. What are Salesmate pricing details? What integrations are available for Salesmate? Pros: As a small business owner with limited resources, I needed a tool that was customizable and cost-effective. Our primary needs were ease-of-use, effective data management, quick automation and seamless integration with third-party apps. Salesmate met all our criteria and proved to be of great value to our small business. Cons: We would like to see features that would assist us in tracking our accounting transaction and managing our projects. Pros: Salesmate CRM is simple to use. For user’s such as me who are already working in a Google environment, it is a boon as it integrates well with the Google Apps. It offers competent CRM capabilities and has a number of useful lead management features. The automation takes care of the manual tasks. Cons: The dearth of integration with every G-Suite App which I wish is resolved quickly. Easy pipeline and project management. Calling made easy. Now I don't need to use any other integration, they provide it within the CRM. I like that part. Best graphics user interface (GUI) and user experience (UX) across all online/mobile project and task management platforms available in the marketplace in 2018. Sales processes, schedule, emails get organized. One can easily check on everything at a glance. Easy to use and UI design is streamlined and appealing. If you need more information about Salesmate or you simply have a question let us know what you need and we’ll forward your request directly to the vendor.